When I finished studying with Dr Christopher at the School of Natural Healing, one of the important concepts I came away with was that a really knowledgeable and skilled herbalist could assist healing in every situation with only five herbs. Any herbalist should know every aspect of a single herb so deeply that he could use it in almost all situations. Creating a formula with only a few herbs is a key mark in the art of herbalism. That being said, plantain is one of the top five herbs that can deal with a vast majority of situations. The others are Cayenne, Lobelia, Dandelion and one more herb of the herbalist’s personal choice. Plantain has had a profound effect in my life. Thirty three years ago at the age of fifteen, I started practicing herbalism, and plantain revealed the real power of plants to me. My brother John is a welder and had some chards of metal become embedded in his knee at work one day, which festered and became infected. His knee was swollen and he couldn’t kneel on it. The worst sign of all was the red line about two inches thick running from his lymph glands behind the knee and up the thigh almost to his groin. It’s just another few feet to the heart and vital organs where the potential for real problems could start. John was scared and didn’t want to go to the hospital, so he came to me seeking healing. I took one look at his blood poisoning situation and thought, Plantain! Now, the greatest aspect of plantain is that it literally grows everywhere and in some of the most desolate places. I have seen plantain growing in every area and state I have been in. Even though I had not treated such a serious situation like this yet, I took the job on with certainty. I began treating his infection with poultices externally and plantain tea internally, and straight away, it started working. I took John to the front yard where I showed him the plant that would literally save his life. We picked a bowlful of fresh leaves and went to the kitchen to chop and mash them up. Next we poured a little boiling hot water over the crushed leaves and spread them on some gauze, which went over the wound. This was covered in plastic to keep the healing plant juices going into the skin rather than evaporating away. With a quart of tea in hand, John left for work. With three changes of poultices the first day, the improvement was outstanding, as the red line that had been running up his leg began to recede and looked noticeably less inflamed. The most important poultice time is the one that stays on all night during sleep. On the second morning as I took the poultice off to change, I noticed four quarter-inch fragments of metal laying there on the top of the skin. To our amazement the swelling was gone, the redness was turning to normal color. The infection and puss were all gone, and no tell tale red blood poisoning line was runnIng up the leg. We continued treatment another two days and John was healed with no doctors, drugs or hospitals. His knee looked as if nothing occurred. 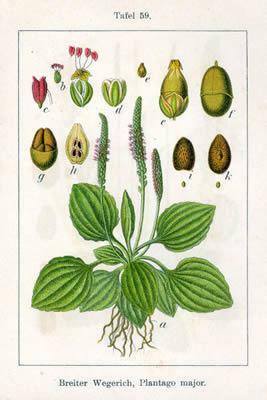 Plantago Major and Plantago Lanceolata are the two most common varieties and they grow from the seashores to the dustiest disturbed vacant lot. As long as there is soil of some kind, it will take root and plantain even will grow in sidewalk cracks. The most obvious difference between the two species is notably the leaves. 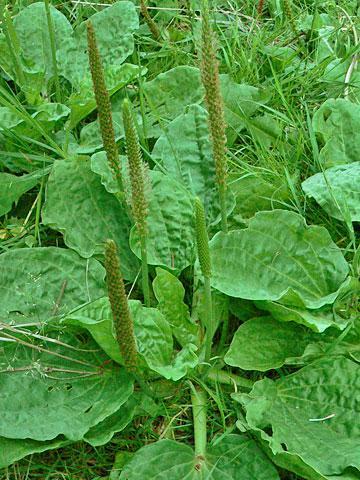 The Greater Plantain Major has large oval to round shaped leaves and the Ribwort Lanceolata has very long and slender leaves shaped like a lance. One thing they share in common is that the veins all run the length of the leaves in a straight pattern, and this is a characteristic that enables one to surely identify it. Plantain was another herb that our fore fathers brought with them to the new world because once again, this is a plant that is completely edible including the roots, leaves, stems, and seeds and also a panacea to cure many ills. Just like the golden tramp Dandelion (see last month’s newsletter), Plantain was referred to as the Englishman’s footprint because everywhere they settled, a plantain plant was sure to pop up and this is just as true today. It is very difficult to find an area with no plantain growing. Plantain is one of the finest alternatives or blood purifiers which tones the organs as well as cleaning the blood. 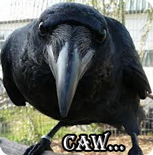 It will clean the system of toxins and mucus, cleanse the lymph system and neutralize a vast array of poisonous venoms. Internally it will help stop bleeding and heal lung issues such as upper respiratory infections. Plantain also is a diuretic for the kidneys and bladder, an astringent to tone, and a demulcent to sooth tissues, a mucus expectorant, cooling to inflammation, antimicrobial, antiviral and an antitoxin. As a styptic and vulnerary, Plantain will assist to help stop bleeding on minor cuts and disinfect them with its powerful antiseptic action. On injuries, it will increase the regeneration rate due to the fact that like comfrey, plantain also contains allantoin, a cell proliferant, which can speed the regeneration of cells up to 3 times as fast as normal. Perhaps one of the greatest aspects of plantain is its blood cleansing anti venomous and deobstruent properties. It will draw out impurities and the poison of snake bites, bee, wasp and insect stings and it is sure in its action at doing this. Plantain will also draw out splinters and thorns with great speed. It is as simple as picking a few leaves and chewing or mashing them to release the juices and applying the mash to the sting or bite, then taping it in place. I have not seen one case of application in this fashion that the individual didn’t feel immediate relief. In emergency situations I have used the tincture and found it worked quite well. It neutralizes the itching of poison oak and nettles almost immediately. Often times due to the deobstruent nature of plantain, one can find the splinter or stinger sitting on top of the skin, as if by magic ,it was pulled out. It’s really quite astounding. Plantain is also completely edible and every part of the plant can be utilized. The leaves can be eaten raw or steamed for a spinach substitute, and are awesome raw in salads and blended into green smoothies, especially the younger ones as the mature leaves may taste slightly bitter. The roots can be juiced or added to soups and stews, the young flower spikes can be eaten as a steamed vegetable, and the seeds gathered and mixed into breads and protein drinks, parched and sprinkled on salads, or ground to flour. The whole plant can be made into a tea for drinking as well and is tasty when sweetened with honey. Plantain is high in beta carotene (vitamin A), vitamin C and K and calcium and a list that goes on..
As you may know, plantain is an ingredient in the herbal formula known as Chomper, the original “intestinal reamer cleaner” manufactured by Arise and Shine. It may be of interest to note that back in 1986, my friend Rich Anderson and I had quite an adventure of living off the land and sleeping under the stars without a tent for many months. During this summer we made some very important discoveries which led to the creation of the “clean me out program” and Chomper. Rich had been sharing the information with me about mucoid layers in the intestinal tract that he had been learning. Well, I had seen these layers come out before but did not realize what they were till then. We had been living on certain wild plants and one day after a large salad consisting of a number of meadow plants, I took off to evacuate and had one of these layers come out. I immediately called Richard and he was totally shocked to see what he thought was impossible to get out without a full program. I remarked that I had seen these layers before and we began to track down the combinations we had been eating for the last few weeks. With more research on ourselves, we made discoveries that astounded us and the rest is Arise and Shine history, with thousands of people around the world benefitting from the lessons we learned that summer, while letting nature be our guide and teacher. Nature is the greatest source of wisdom if we can only let ourselves be still and listen. Ho!